We all love travelling because it’s exciting to explore new places, cultures, food, people and etc but sometimes it can turn out to be a real pain. Why? Let’s face the reality, there are many things that can go wrong when we travel. For example from losing our wallet, passport, baggage, to even a simple thing like forgetting to put our toiletries in our luggage, small things can easily ruin our trip. Well you know murphy law, something that can go wrong will go wrong. However if we lose our wallet, cash, credit cards on a trip or even run out of cash when we travel, there is solution to these problems. Now, we can travel at ease with e-remit. Let me share one of my travel experiences with you, I was pickpocketed a few years ago when I was in Tanah Abang, Jakarta the wholesale market. They did it so smooth and fast that I was not aware of till I wanted to pay for my shopping. Only then did I realize that there were slits on my bag. Luckily I left my passport in the hotel safe. I wish I knew about e-remit at that time so that I wouldn’t have had to borrow money from friends and feel so bad that they have to limit their shopping because of me. e-remit is actually an online remittance service from Merchantrade Asia Sdn Bhd, Malaysia’s largest non-bank remittance service provider. It provides secure online remittance services to 9 countries such as Indonesia, Singapore, Pakistan, India, Bangladesh, Philippines, Myanmar, Nepal and Sri Lanka through its user friendly website. So just in case when we travel and we lose our cash, credit cards or even if we run out of cash when we are in these 9 countries, we can easily and securely transfer money from our own Malaysian online banking account to a cash pickup branch in the particular country that we are in. Soon, e-remit will be able to provide online remittance services to over 200 countries worldwide, giving us even more ease no matter where we are travelling to. Our family members can also transfer cash to us through their own e-remit account and vice versa. Plus if you have children studying in any of these 9 countries, or a maid that needs your help to transfer money back to their families in these countries, you can easily get this done even when you are abroad through e-remit. When dealing with money, safety and security are my priorities. 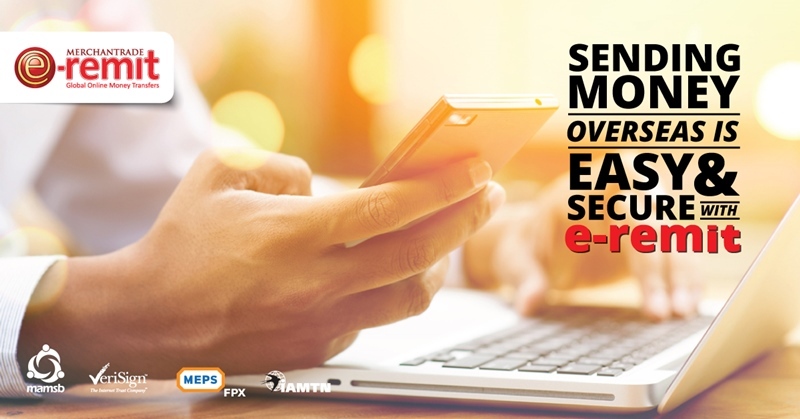 I have check out that e-remit’s transactions occur over secure SSL (Secure Socket Layer) connection as well as firewalls with advanced security systems. In addition, the website is certified by VeriSign Secure Seal (VeriSign) and supported by Financial Process Change (MEPS-FPX) and the International Association of Money Transfer (IAMTN) proving that e-remit provides one of the safest and most secured online remittance services. I just signed-up e-remit a few weeks ago. The e-remit site is user friendly and convenient. It’s so simple to sign-up and use their services. 1. Register: Go to www.eremit.com.my and register as new user by filling up the online Registration Form. 2. Verify: As a new user, e-remit only requires you to complete a one-time document verification at any one of Merchantrade’s 69 branches after the quick online sign-up process. All you have to do is submit a copy of your NRIC/Driving License for Malaysian Citizens or Passport / Visa for Non-Malaysian Citizens. If you do not have time to verify your documents at the branch, you can make an appointment with their personnel for a complimentary door-to-door verification which is only available in Klang Valley area. You can book your appointment by calling their Customer Care Line at +603 7724 2070. 3. Send Money: Once verified, just sign-in online, fill in the relevant fields of the Recipient’s particulars, enter your banking information and you are ready to transact. 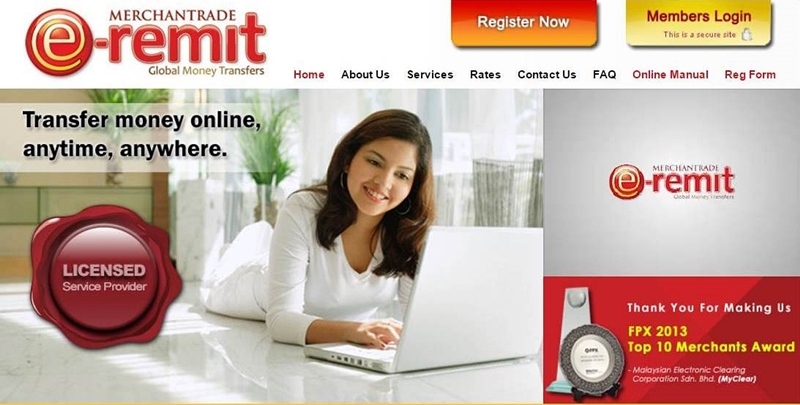 e-remit is the easier and more convenient option when doing remittance because it is an online service and it can transfer money from any MEPS-FPX account. As you know I am always busy and not able to verify my documents at any of Merchantrade’s branches, so I made an appointment with an e-remit personnel at one of the cafés at a shopping mall instead of my house. It was really convenient and easy to do verification. Other important key points to consider when we transfer money are the exchange rate and also delivery time. So far e-remit offers fairly good exchange rates with low service charges. Usually it only takes 1 working day for the money to reach the recipient. In some countries, it may take up to a maximum of two working days depending on the country. We can transact a maximum amount of 8 transactions a month but the total transaction per day cannot exceed RM 20,000 for all 9 countries. We can transfer money on any day of the week between 7am to 9pm. Another thing I like is that there is no charges impose on the receiver, meaning that e-remit only charges a one-time service fee on the sender. Alright, I trust that I have given you a solution and some tips to solve your travel problems. When you’re out of cash or need more cash during your trip you can rely on e-remit. Everything can be done online and hopefully you can get your e-remit account ready and verified before you travel. It's good to know that e-remit provides best currency exchange rate with low service charge. This is so nifty. Good info to have for travellers. Thanks for sharing. Nowadays there are so many choices and convenience of transferring cash anywhere in the world.. Always good to know there are these features when you are traveling.. There will be no worries during travelling. Hope that, they can have this service in more country soon. Oh wow, I did not know about this. Definitely a safer way to transfer money! wow something new for me.. the closest i've seen which is similar but different would be the Maybank e-wallet. this is new to me. i need this since i will be travelling frequently, just in case. Always found sending money or doing online financial transactions really risky because of cyber hacks and all. How safe is it exactly in the hands of E-REMIT? e-remit? Something new for me.. Thanks for sharing the info! This is really a new and informative information for me. It looks really convenient to use and we can easily pay our bill online! This is pretty good information for all the travellers and so convenient to pay our bills. Great to know about this Kels, definitely needed to know more about it <3 Definitely very useful on our end and its rather convenient too. great info sharing! what's even best is that we can travel to everywhere worry free!! First time to know e-Remit. Sounds it is so convenient. Thanks for sharing ya.